Harker hosted nearly 500 families from the greater Bay Area for an all-day forum in December designed for families of gifted children. 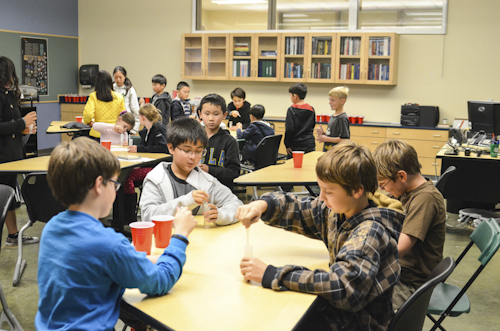 Operated by the Scholar Search Association, which was founded in 2009 by Patsy Kumekawa, the Educational Forums for Gifted Student Families events have now been held in dozens of cities across the country, including the one recently hosted by Harker. “We hope that we are helping kindred spirits to find one another so that they may share their experiences and ideas, support each other’s efforts and revel in the excitement of discovery and of thought,” Kumekawa explained. In addition to hosting the event, Harker faculty, staff and students contributed to the event’s success. A panel on leadership, moderated by Greg Lawson, assistant head of school for student affairs, included upper school seniors Maverick McNealy, Tiphaine Delepine, Simar Mangat and Apricot Tang, as well as Harker parent P.V. Kannan (Sandhana, grade 9), discussing the definition and importance of leadership. Student workshops were presented by faculty members Karina Momary (debate) and Eileen Schick (Singapore Math), and more than a dozen student volunteers helped as guides the day of the event. For more information about Scholar Search Association and upcoming events, visit http://www.scholarsearchassoc.com/.